A new, state-sponsored program will allow San Diego County residents to apply online for instant rebates on the lease or purchase of new electric vehicles. The rebates range from $900 for zero-emission motorcycles to between $1,500 and $5,000 for passenger cars. They cover battery-electric, plug-in-hybrid electric and fuel-cell-electric vehicles. An additional $2,000 is available for qualified lower-income residents. The Clean Vehicle Rebate Project, which has issued over $480 million in rebates since 2009, is testing the program in San Diego County before potentially rolling it out statewide. 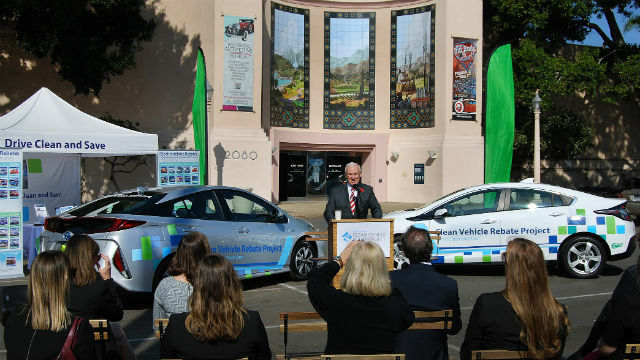 “Car shoppers in San Diego can now get pre-approved before they purchase or lease an EV and then transfer the rebate amount directly to the dealership rather than applying for the rebate after the transaction,” said Lawrence Goldenhersh, president of the San Diego-based Center for Sustainable Energy, which administers the project for the California Air Resources Board. More information about the program is available online at CleanVehicleRebate.org.